Microsoft Office Excel 2007 provides several methods for starting and exiting the program. You can open Excel by using the Start menu or a desktop shortcut. When you want to exit Excel, you can do so by using the Office button, the Close button, or a keyboard shortcut. To start Excel 2007, choose Start→All Programs→Microsoft Office→Microsoft Office Excel 2007. A new, blank workbook appears, ready for you to enter data. 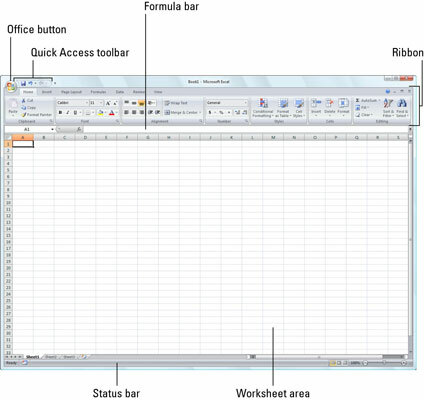 Excel 2007 displays a new, blank workbook named Book1 when you start the program. Click the Start menu and then right-click Microsoft Office Excel 2007 on the Start menu to open its shortcut menu. If you don’t see Microsoft Office Excel 2007 displayed on the recently used portion on the left side of the Windows Start menu, start Excel 2007 and then repeat this step. Click Pin to Start Menu on the shortcut menu. After pinning Excel in this manner, the Microsoft Office Excel 2007 option always appears in the left-hand column of the Start menu, and you can then launch Excel simply by clicking the Start button and then clicking this option. Right-click Microsoft Office Excel 2007 on the Start menu, highlight Send To on the shortcut menu, and click Desktop (Create Shortcut) on its continuation menu. A shortcut named Microsoft Office Excel 2007 appears on your desktop. You should probably rename the shortcut to something a little friendlier, such as Excel 2007. Right-click the Microsoft Office Excel 2007 icon on the desktop and then click Rename on the shortcut menu. Replace the current name by typing a new shortcut name, such as Excel 2007, and then click anywhere on the desktop. Click the Office button followed by the Exit Excel button. Press Alt+the letters FX or Alt+the F4 function key. Click the Close button in the upper-right corner of the Excel 2007 program window (the X). If you try to exit Excel after working on a workbook and you haven’t saved your latest changes, the program displays an alert box asking whether you want to save your changes. To save your changes before exiting, click the Yes button. If you don’t want to save your changes, click No.